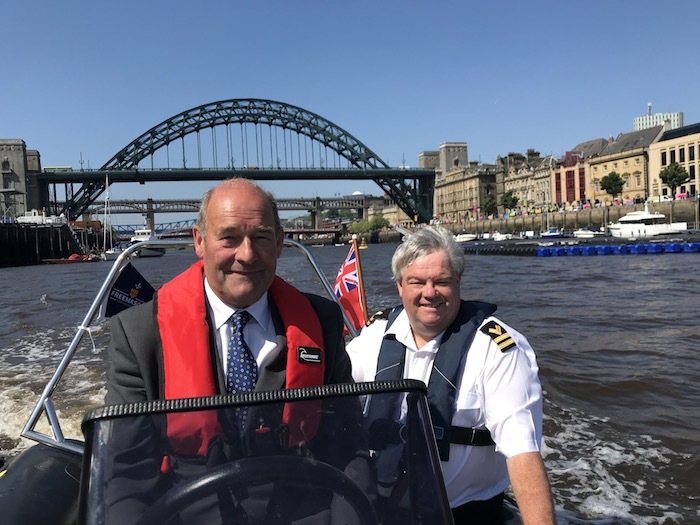 A nautical charity that operates regionally from Berwick to Hartlepool and provides invaluable support, both afloat and ashore at events such as the forthcoming Tall Ship’s Race in Sunderland has received a new boat to assist in training its members and helping the community. Angela Carrington and Keith Newman on vessel, Donald Auld, Ian Craigs, Kevin Stannard and Dr Greg Smith. 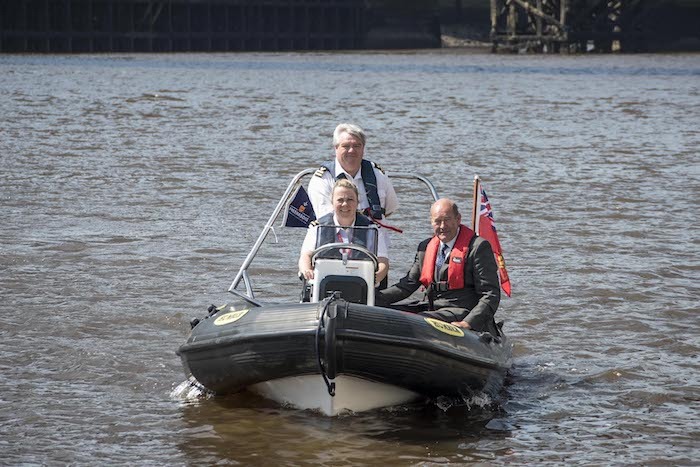 The Northumbria Unit of the MVS received its new rigid inflatable boat aptly called “Northumberland Freemason” at the NE1 Pontoon on Newcastle’s Quayside after a £15,000 donation to the MVS from the Freemasons of Northumberland. 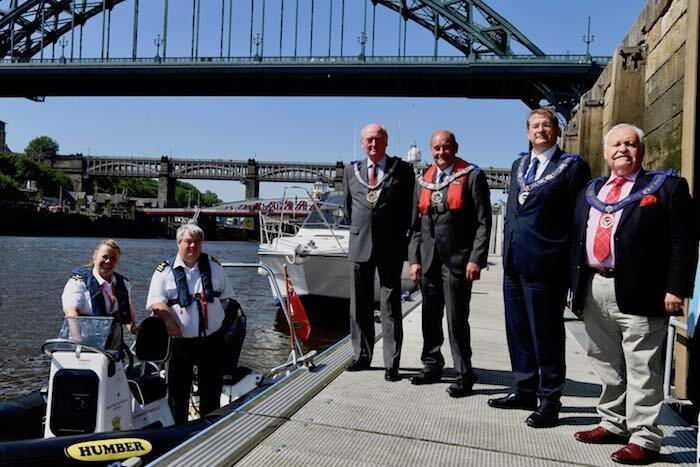 A delegation of freemasons came to watch the naming ceremony which included the Provincial Grand Master of Northumberland, Ian Craigs, christening the vessel with an appropriate bottle of Newcastle Brown Ale right in sight of the iconic Tyne Bridge. The “Northumberland Freemason’s” first duty will be at the Tall Ships Race in Sunderland in July. Members of the Northumbria Unit will provide support to the event’s organisers with the boat being deployed effectively in a variety of roles including marshalling exclusion zones, general patrolling and ferrying crew members across the Wear. This is a very generous gift to our charity from the freemasons that will benefit our members and the community too. We will be using the boat on all of the region’s rivers so she will be a common sight from the Tweed to the Tees. She’s a very manoeuvrable craft making her ideal to train people in seamanship and boat handling skills. In turn, we will pass on these skills to help at community events all across the region. We are very grateful and will sail her with pride. All of our trustees agreed that this was a very worthwhile cause to donate to as the vessel is being used on the region’s waterways doing sterling community work. We are proud to be associated with MVS Northumbria and look forward to hearing more about “Northumberland Freemason’s” good work as time progresses.